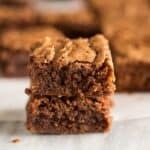 Thick and chewy Chocolate Frosted Brownies--just like the lunch lady brownies you ate as a kid! In a mixing bowl add sugar and oil and stir till combined. Add cocoa powder and mix. Stir in salt, flour, and vanilla and stir until combined. Bake at 350 degrees for 30 minutes or until a toothpick inserted in the center comes out clean. Allow to cool completely before frosting. Cream the butter until it seems light and fluffy. Add the cocoa powder and salt and beat until well combined. Add vanilla. Alternately add powdered sugar and milk, mixing well until you reach your desired frosting consistency. Add more milk for softer frosting or more powdered sugar for firmer frosting. Spread frosting onto cooled brownies.